Combine 4 quarts of the water and lemon juice in a large bowl; set aside. Fill a Dutch oven 3/4 full with water; bring to a boil. Immerse peaches for 20 seconds or until skins easily peel away; remove with slotted spoon and plunge into ice water. Slip skin off peaches using a paring knife. Cut peaches in half; remove pits. Place peach halves in the water and lemon juice solution to prevent browning. Cut peaches into chunks; place in food processor. Process until finely chopped. Measure exactly 3 cups of fruit. Combine peaches and 3/4 cup water in a large saucepan. Gradually add pectin, stirring until blended. Bring mixture to a full rolling boil (a boil that doesn't stop bubbling when stirred) over medium-high heat. Boil for 1 minute, stirring constantly. Remove from heat; add Splenda Granulated Sweetener stirring until Splenda Granulated Sweetener dissolves. Skim off any foam with metal spoon. 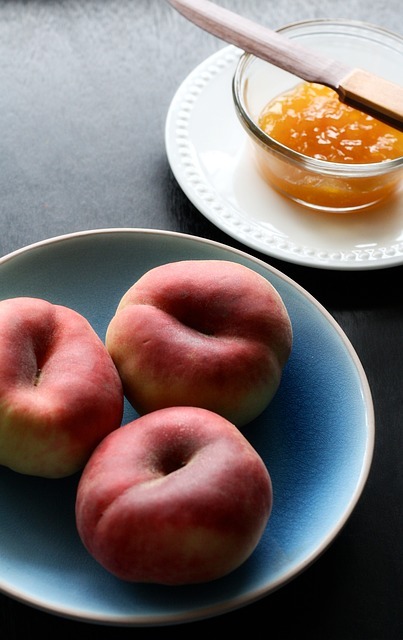 The flavor of succulent summer peaches really comes through in this simple recipe.